When weekends arrive in Chicago, I tend to smile a little wider. I can sleep later in the mornings. I get a reprieve from hand-holding fellow colleagues at work. And I can eat until my heart is content, my belly is filled, and I can take a nap without anyone running into my space and disrupting it. Saturday morning arrives, it is sunny outside, I am on my way to some eatery, and then there is this thing called cloud coverage — always followed by cloud bursts of torrential downpours — that messes up the merry work for any outdoor activity. This has been a weekend phenomenon almost wears me down to spiritual defeat. But my appetite remains in tact, though. After work a few days ago, I went by a Pan-Asian eatery that is in the concourse between the Red Line at Lake Street and the Blue Line at Washington Street. In the lower level of the new mall at 108 N. State Street is Simply Thalia, which is simply an Asian cafe of all good things. When I had gone the other day, my appetite was way off the scale because I had recently increased my workout routine and I had a hankering that was driving me sideways the wall. Having gone to the restaurant several months past and had a panang dish, I was not necessarily thrilled with the diligence done to their Thai curry dishes — more watery than hearty — but I was hungry and there are other items on their bill of fare. Today I wanted to try a different approach and I had decided that I would keep with my Snacking on Saturday [convenient] tradition. I was only going to have appetizers and, by George, I was going to like it. That was me psyching myself up for the edibles. There was very little convincing that I had to do. Focusing on the appetizers, which were priced very low, I eyed three items that I wanted to delight myself with. I started with Saigon shrimp rolls. 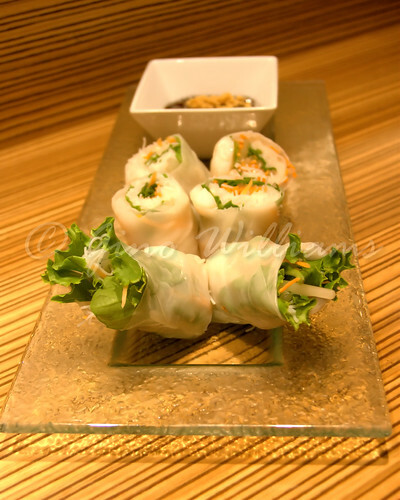 Who would have thought that rice paper rolled with shrimp, cucumber, carrots, lettuce, cilantro, bean sprouts, rice noodles, and mint could be so blooming satisfying? The Vietnamese apparently figured it out and the shrimp rolls that I feasted myself on with the complementary dipping sauce, consisting of a plum sauce and a hint of teriyaki sauce, really made an impression on me. This was the first time I have had Saigon shrimp rolls and loved them. My hat goes off the chef, cook, or frozen food merchant who dealt me this treat. The next appetizer I had was Burmese samosa. 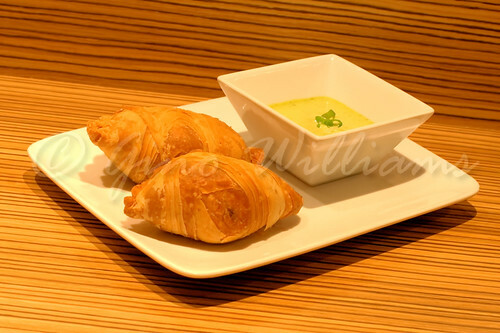 Flaky to perfection and stuffed with sweet curried potatoes and spiced chicken, my mouth burst with flavours of Burma. 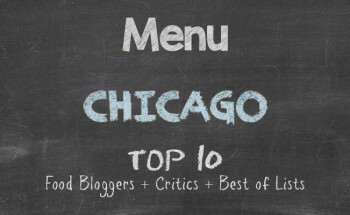 One ethnicity lacking in the Chicago multi-cultural restaurant spectrum is Burmese. Albeit a small items on the larger menu, I was reminded of the fine eating experiences in many Burmese restaurants in Toronto, Ontario, and in Washington, DC. Served with a sweet mustard accented with a hint of cilantro, I know now that it is time for me to visit old friends in Toronto and in DC — to catch up with my friends, of course — for some loving from the kitchen courtesy some Burmese. The final appetizer was Malaysian roti canai. 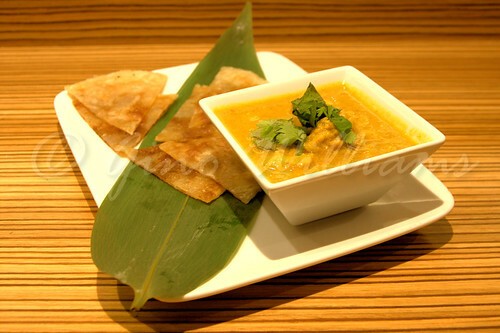 Malaysian home-made naan served up with curry chicken dipping sauce was an absolute taste of heaven. It is quite evident that Simply Thalia does not concoct thick curry gravies, a case with the thin base for the curry chicken sauce. However, this curry was only thin, not watery, and it worked very well with the roti. I could eat the Malaysian roti canai everyday for the rest of my life and never grow tired of it. Hmm. Wait. I have a threshold and everyday would be too much; I would not want to risk tiring myself of such a dish full of love. But I found the roti alone to be a welcome to the palate and the curry sauce made it that more appetizing. I cannot place Simply Thalia in any one ethnic bucket as there are many Asian cultures represented in the food — Japanese, Chinese, Malaysian, Burmese, Thai, Vietnamese, Korean, and Indian just to name a few. What I will add is that for there to be a plethora of Asian cultures present in the food at any one restaurant, there is a splendid job done keeping each ethnic dish specific to the culture which it represents, rather than introducing fusion and competing flavours. For the three appetizers and some organic tea, the tab for my moment of food bliss was under $20. Small and rather close, Simply Thalia has a feel of a lounge — minus super tan blond Rachels in high heels and mini skirts and Oompa Loompa orange Barts in clothes way too tight. Granted servers do not perform acrobats to please your sensibilities, I was appreciative of the fact that when I had said I wanted each appetizer one at a time and spaced out between delivery, the individual who took my order honoured my request. So my three factors that keep me returning were there: great service, low price, and outstanding food. What am I going to do when I increase my workout routine again? That was a rhetorical question. Also, Simply Thalia has a parent restaurant named Thalia Spice, which is at 833 W. Chicago Avenue. I am almost certain that the food is worthy of a visit. And even if you still want a sample of their tasty menu items, you can order online from your desktop or from your smart phone. I think I am outside of the delivery area, but I will go and have a seat at one of the tables and see what delight I can derive from some Pan-Asian sampling. Thank you for such a wonderfully written review. We took a lot of pride and care in what we do here at Simply Thalia, thank you for noticing it and we appreciate your kind word of encouragement, it means a lot to all of us here at Simply Thalia. During my second, third, and fourth returns, I have enjoyed the food. 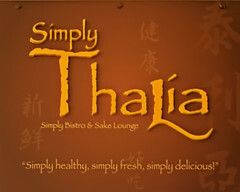 I am curious as to whether Simply Thalia and Thalia Spice are partner restaurants or just have the same culinary theme. Once again, the food and service have been excellent.